We had a fun meeting on Sunday the 25th of September. It was the start of Daylight Savings Time, but it seemed everyone remembered it in time, and no one was too late at the meeting because of it. We started off with the usual greetings, and caught up with news and updates from everyone, with a quick chat as usual. 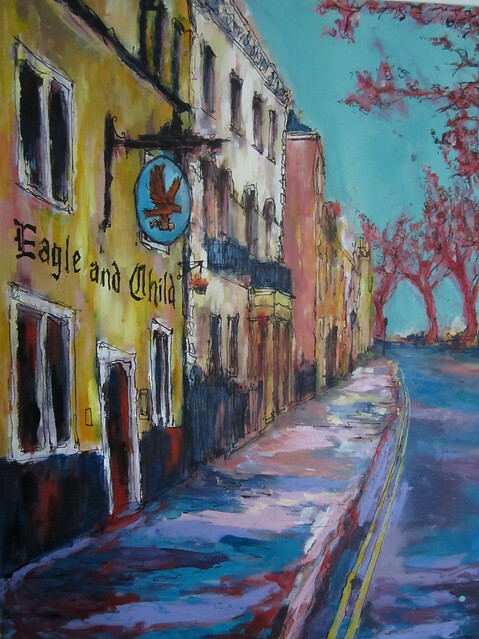 Mooter Sarah had recently visited England's Oxford and visited Tolkien's favourite pub The Eagle and Child for a meal, and brought back a few souvenir postcards by Andrew Manson. Andrew, who was the Artist in Residence at the pub, had a writeup in the Oxfordshire magazine recently, which is available as a pdf file here. The theme for this meeting was "the diverse landscapes of Middle-earth". Everyone brought their books, tablets or their knowledge of Middle Earth. We talked about landscapes, forests, and mountains. We enjoyed sharing our ideas and thoughts. Alex was particularly interested in the “stone-giants” from The Hobbit; there is not much explanation in Tolkien’s books and the ambiguousness of their existence; are they from Bilbo's dreams, or are they real? Kris found some good photos with rock falls, where it is believed that Tolkien got the idea of the “rock-giants” and found an article why they play games by throwing rocks, and risking their lives. Next Welly-moot meeting will be the last meeting this year already. It will also be the last meeting hosted by Jack and Alex. As it was announced on the last post, we will be stepping down from being the main hosts of the meetings. We have a few Welly-mooters who have have got their hands up, to take over from us. But don’t worry, we won’t disappear. We will still be attending Welly-moots. Before we go though, we decided to have a picnic lunch on Sunday 20 November at Rivendell in Kaitoke Park in Upper Hutt. We will try to have some attractions on the day as well - maybe a swords demonstration, a guided forest walk, best costume competition, or whatever. Come and join us! We will post the details when it is closer.